Before using Echo to control your smart devices, make sure you meet the following conditions. 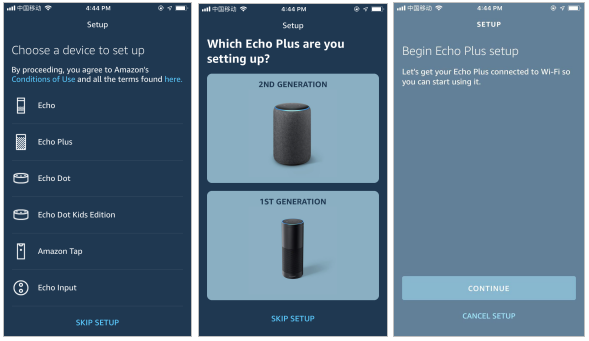 An Echo device, including Echo, Echo Tap, or Echo Dot. You can skip this part if you’ve already add some devices to your Smart Life account, and in the meantime the devices’ name are easily recognized. You can also search “Smart Life” in either App Store or Google Play to install the app. Note:“smart life”app is just a app name（for example），you can download your app. Open the Smart Life app, tap “Register” to register an account, then sign in the app. Sign in with the Smart Life account, add the device, then change device name to a easily recognized word or phrase, like “bedroom light”. We suggest using web for configuration in mainland China since Alexa app is not available here. User can configure Echo through web or Alexa app. Web configuration link: http://alexa.amazon.com/spa/index.html. 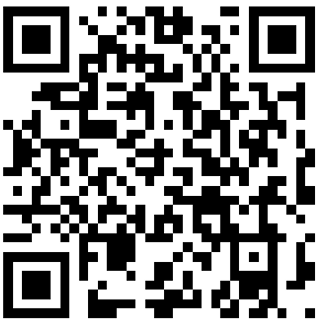 Search “Amazon Alexa” in App Store or Google Play to install the app. You can skip this part if your Echo is already set up. Make sure your Echo device is energized. Make sure Echo is in a Wi-Fi network that can access Amazon services smoothly. 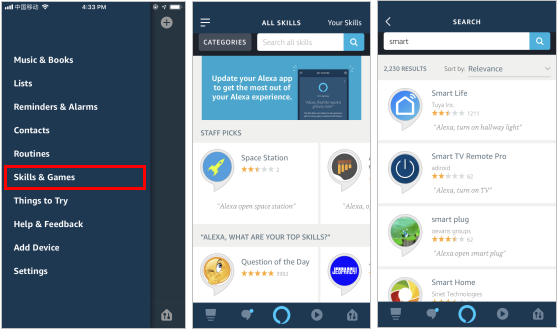 Open the Alexa app by tapping the app icon on your mobile device. 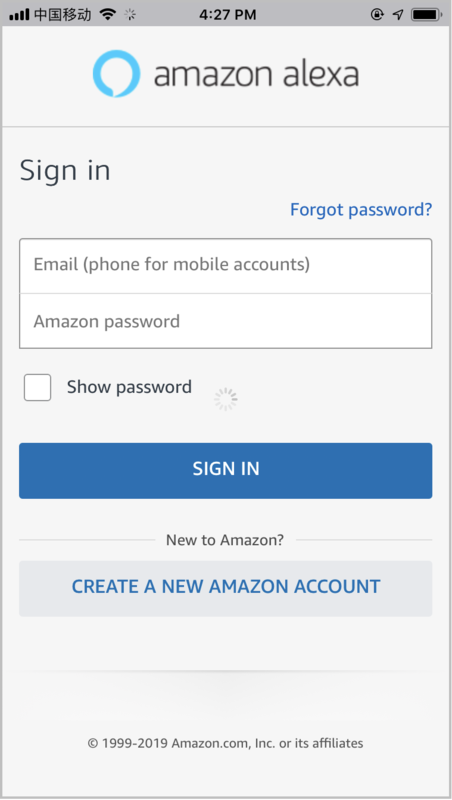 Type in your Amazon account and password, then tap “SIGN IN”. 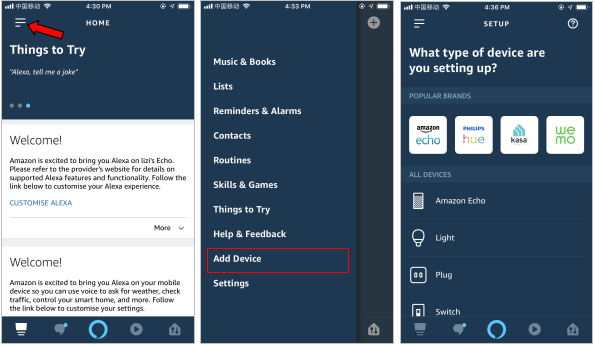 Tap the hamburger menu on the top left corner, select “Add Device”, Select Amazon Echo in the Set up page. Select the type of your Echo, then tap "CONTINUE ". 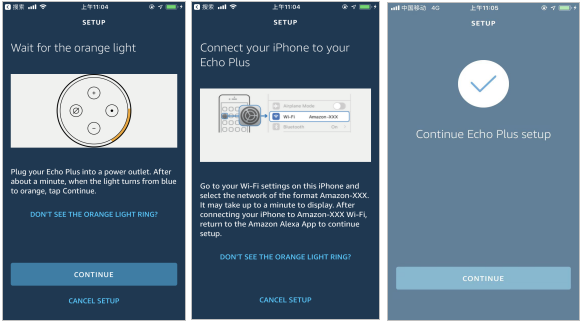 Long press the dot button on the top of your Echo device until the orange light shows up, then tap “CONTINUE”. Make your mobile phone connected to the hot spot of echo, then tap “CONTINUE”. 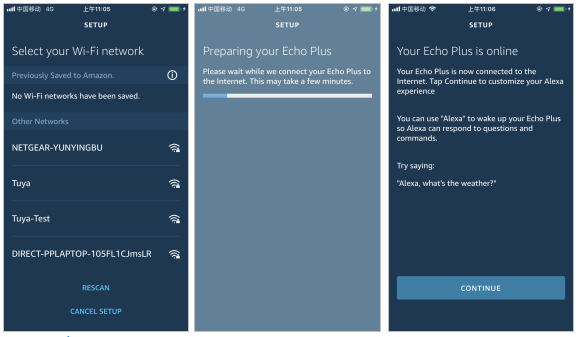 Select a Wi-Fi to let Echo have the access to the internet. Type in the Wi-Fi password, then tap “CONNECT”. Echo may take several minutes to connect the network. 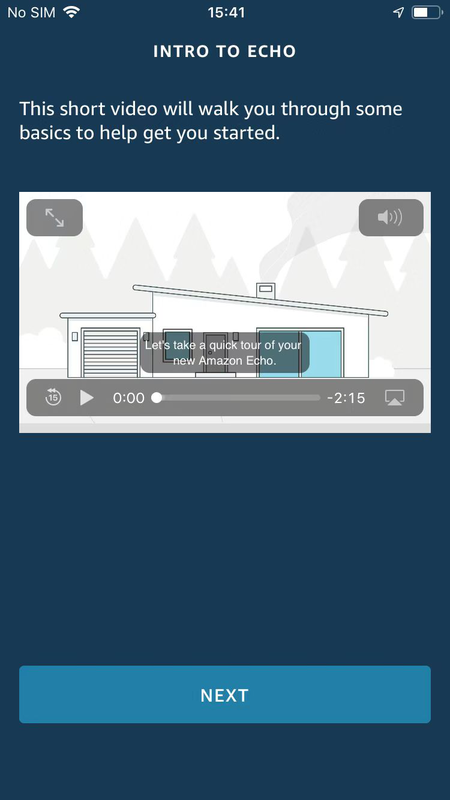 Tap “CONTINUE” when Echo is connected to the network. After an introduction video, tap “NEXT” to finish the setup.At this point, the Echo configuration process ends. Tap “Skills&Games” in the hamburger menu, then search “Smart Life”. Select “Smart Life” and tap “ENABLE” to enable the Skill. You will be redirected to the account link page. Type in your Smart Life account and password, don’t forget to select the country/region where your account belongs to. Then tap “Link Now” to link your Smart Life account. The country/region, the account, and the password must match with the exact content in Step 2.2. Echo needs to discover your smart devices before it controls them. After the skill binding is successful, the page as figure1 will appear automatically. 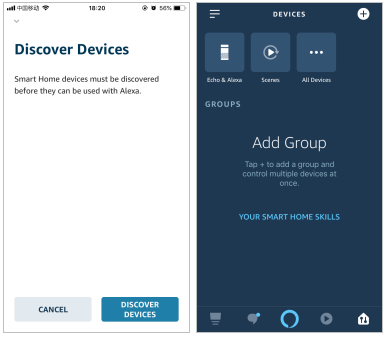 Click “DISCOVER DEVICES” to discover the device, or you can say “Alexa, discover devices” to Echo. 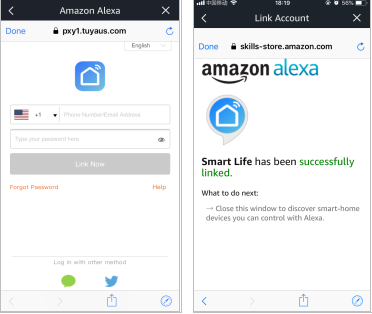 Echo will discover devices which have already been added in the Smart Life app. You can also tap “DISCOVER DEVICES” to discover the smart devices. Discovered devices will be shown in the list. Note: every time you change the device’s name on Smart Life app, Echo must re-discover before you control them. Alexa, turn on/off bedroom light. Alexa, set bedroom light to 50 percent. Alexa, set bedroom light to green. Alexa, set bedroom light to warm white. Alexa, set air conditioner to 24℃.